Breastmilk is the purest form of food that you can provide your baby. It is devoid of any contamination and contains all necessary nutrients for a newborn baby. WHO recommends breastfeeding your baby exclusively for the first six months and after that continue until the baby is two years of age. There are only very few instances where a mother has to stop breastfeeding the baby. That is when the mother is afflicted with extreme food poisoning. Food poisoning is said to have occurred when you eat food contaminated with bacteria, virus or other toxins. Few of the toxins or bacteria that cause food poisoning are salmonella, E-coli, listeria, and Shigella.Rotavirus can also result in food poisoning. In addition to these certain parasites like Giardia can also make you sick. Sometimes eating raw food or undercooked food can also result in food poisoning. Thus, breastfeeding mothers should ensure that they eat only fresh and properly cooked food while feeding the baby. But the good news is that breastfeeding mothers can continue feeding even when she is affected by food poisoning. Vomiting and nausea:Vomiting and nausea usually start an hour or so after consuming the food. In extreme cases of food poisoning, even drinking water can cause vomiting. Diarrhea: In this condition, the stool is passed in liquid form at frequent intervals. Excessive diarrhea can result in dehydration, tiredness and dry mouth. It can also lead to general muscle weakness. Fever: Some people may even develop a fever with extreme tiredness. This is because of the bacteria or virus acting in your body. Is it Safe to Breastfeed during Food Poisoning? It is entirely safe to breastfeed your baby during food poisoning as the bacteria and virus are present only in your abdomen. It does not get mixed up with the breast milk. But, if you are experiencing extreme symptoms of food poisoning, then the doctor may prescribe antibiotics. In such a situation, you should inform the doctor that you are breastfeeding. The doctor will then prescribe you a medicine that is safe to consume at this stage. Similarly, if the food poisoning gets mixed up with your blood, then also you should stop feeding your baby. Stay in bed while feeding the baby: Instead of making the baby lie on the bassinet or crib you can have the baby next to you. This way, you do not have to walk up to the bassinet to carry the baby and feed. You can even feed the baby while lying down till you feel better to sit and feed. Drink water: Staying hydrated is very important when you are down with food poisoning. It becomes even more important when you are feeding the baby. Sip water at regular intervals so that you do not go into dehydration. Take medication: If you have a severe case of food poisoning, it is advisable to visit a doctor and take prescribed medicines. This will ease your symptoms and will prevent the toxins from entering the breast milk. Take rest: Though it can be challenging to take rest with a baby, try to stay in bed as much as possible. You can seek the help of your friend or family for babysitting. If you are completely drained off, you can even consider formulae feeding the baby till you feel better. The food that you eat during this stage should provide you with energy and at the same time relieves your symptoms. Low fiber and low-fat food that are gentle to the stomach like banana, cereal, oatmeal, and toast can be consumed. The BRAT diet is a good choice when you are down with food poisoning. At the same time, you should avoid food that is high in fat and harsh to the stomach like fried snacks, spicy food, caffeine and fruit juices. 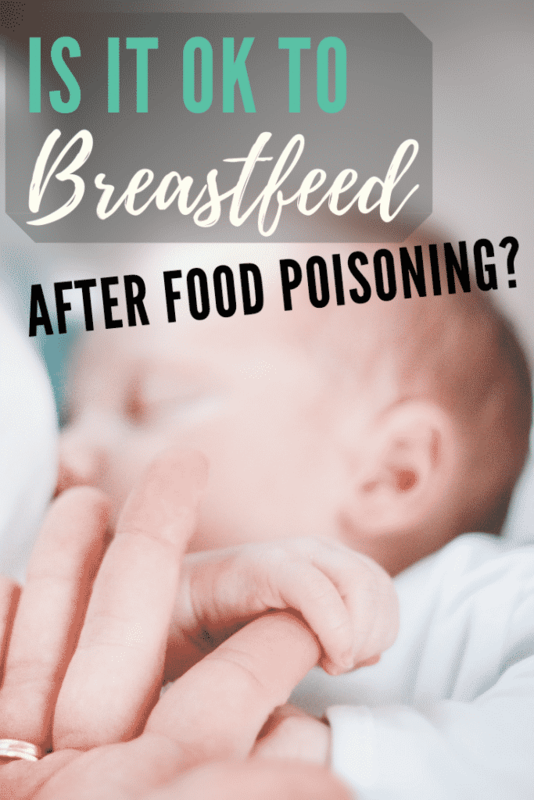 How to Prevent Food Poisoning While Breast Feeding? Always eat food from neat and clean places. Do not eat food that is uncovered. Avoid eating junk and undercooked food. Drink plenty of water so that even if you fall sick, the toxins will be flushed out of your body. Try to eat home-cooked food as long as you are exclusively breastfeeding your baby. Prevention is better than cure. It is always better to watch your diet and keep your food intake under control as long as you are breastfeeding your baby. After all, your baby’s health depends on what you consume.